• Preset Feeding Settings at 8 min. and 16 min. • The Alternating Water Currents Can Be Set to Switch Every 15 sec. to 30 min. 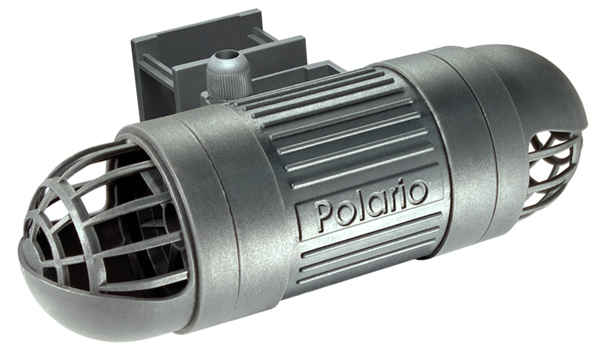 I currently am running this powerhead(15ml) in my 120 gal mixed reef. I must say it is super quiet and super strong! The only thin I can fault this equipment for is the openings in the fish guards. When the unit switches currents, even though the unit is programmed to raise currents gradually the initial pull from the opposite side is very strong and small schoolfish can’t avoid the current. Hence accidental feeding of your tank since the fish gets chewed up and spit out the other side. I am very saitisfied since the larger fish have no issues swimming out of the currents it provides. I have zero dead spots and the only other water movement in the tank is from a K3 and the return pump. I would be happier if the unit was not so bulky. I would not recommend this unit on anything smaller than a 90 gallon tank. Hope that my review helps! Have the smaller model in my 180 reef….That’s it! Perfect circulation and quit using a very expensive brand and controller that had a narrow over powering flow. This sits up high in the middle and easily covers the 72″ length alternating currents every 15 seconds. Almost noiseless and the controller just has heat sinks no mini fan as reported in first versions. No algae and orp 280-330 most of the time. No ozone or charcol. Just a skimmer, biopellet reactor, phosphate reactor with just zelv stone.